I am a graduate of Ball State University with a bachelor's degree in House Design. I have been in the floor covering industry since 1990 and started working with Kermans in 2005. I enjoy working with builders and homeowners alike. From helping the customer select flooring for their new home, then coordinating with the builder on site production and scheduling – I love seeing a home site taken from framing stage all the way through final finishes. 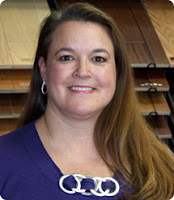 Tammy is an important part of the Kermans Advantage – unparalleled service and knowledge backs up every sale. Whether you are carpeting a mansion in Carmel or looking for an area rug for your first home in Fishers, you’ll experience the same attention, care and exceptional result. Learn more about Kermans.